ALEXANDRIA, IN - Mary Joanne (Tuerffs) Sullivan (88), Alexandria, passed away on Friday, July 13, 2018 at Community Northview Care Center in Anderson after a brief fight with cancer. She was born on March 4, 1930 in Memphis, TN to Joseph and Dorothy (Fullerton) Tuerffs. The Tuerffs family moved to Alexandria in 1933 where they lived and flourished the remainder of their lives. Other than her three years in TN, Joanne was a life-long member of St. Mary, Alexandria, where she went to and graduated from grade school. She graduated from Alexandria High School in 1948. Joanne married Harry Jay Sullivan, Alexandria, on July 26, 1952. She graduated from Ball State College (University) with a B.S. and a M.A. degree. Her career began with teaching high school English and acting as Dean of Girls at Mississinewa High School from 1952 to 1964. In 1965, she moved to Elwood High School where she taught English and journalism and was yearbook advisor. She also taught night adult education classes at the John Hinds Vocational School. In 1977, the Elwood Business and Professional Women’s Club named Sullivan as Woman of the Year for all her work towards education in the community. She retired from teaching in 1992. Joanne was an active member of St. Mary Catholic Church where she was a reader, member of the parish council, and a leader in the RCIA program. She also managed a Catholic religious store in the church for several years. After her retirement from teaching, she volunteered as a substitute teacher and office help at St. Mary Catholic School. In 2010, she received the Daughters of Isabella Volunteer of the Year award for her many years of volunteerism at both St. Mary church and school. 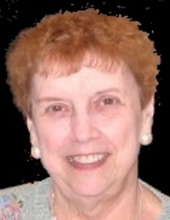 Joanne was an active member of the Alexandria Art Circle for over 50 years. Joanne was also a former member of the Alexandria Library Board and the Delta Theta Tau and Delta Kappa Gamma sororities. She was also a strong supporter and fundraiser for cancer research in the Alexandria community and Madison County. Joanne is survived by several cousins and many friends from St. Mary Catholic Church. She was preceded in death by her husband in 1972 and her parents. Family and friends of faith are invited to a rosary recitation at 9:30 am on Friday, July 20, 2018 where public visitation will begin after 10 am in the narthex at St. Mary’s Catholic Church, 820 West Madison Street, Alexandria. A Mass of Christian Burial will follow at 11 am with Father Dan Duff as Celebrant. Interment will follow in the I.O.O.F. Cemetery in Alexandria. In lieu of flowers, memorials can be made to St. Mary Catholic Church or St. Mary’s School Scholarship Fund or the Madison County Little Red Door Cancer Agency with envelopes available at the church on Friday. Owens Funeral Home in Alexandria is honored to care for Joanne and the Sullivan/Tuerffs family. To send flowers or a remembrance gift to the family of Mary Joanne Sullivan, please visit our Tribute Store. "Email Address" would like to share the life celebration of Mary Joanne Sullivan. Click on the "link" to go to share a favorite memory or leave a condolence message for the family.